The driver’s door has a master power window switch that controls all the windows in the vehicle. the ignition switch must be in the ON position for power windows to operate. To open a window, press down on the front portion of the corresponding switch. To close a window, pull up on the front portion of the corresponding power window switch. The power windows can be operated for approximately 30 seconds after the ignition key is removed or turn to the ACC or LOCK position. However, if the front doors are opened, the power windows cannot be operated even within the 30 seconds after the ignition key removal. 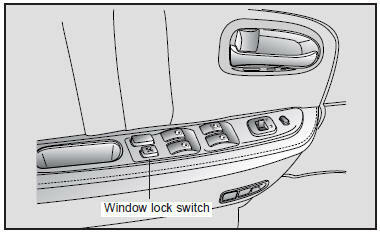 The driver can lock the power window switches on all passenger doors by depressing the left side (flat portion) of the “WINDOW LOCK” switch located on the driver’s door to ON (flat side down). When the power window lock switch is ON, the driver’s master control can not operate the passenger door power windows either. Keep the power window lock switch in the driver’s door in the ON/“LOCK” (left side/flat portion of switch down) position, except when someone is operating a passenger door window. Serious injury can result (especially to children) from unintentional window operation. If you notice buffeting and pulsation (wind shock) with either side window open, you should open the opposite window slightly to reduce the condition.